The Hotel has been designed and furnished according to the modern canons of cromotherapy, and in the garden by the pool, there is a solarium with a bar, where our guests can sip delicious cocktails. At the Hotel Terme Acqua Grazia**** everything is focused on guest's well being. The Hotel has an internal Spa and Wellness Centre. It is an area of 500m², with the hot spring “Fonte Acqua Grazia” that flows directly inside the building. the wellness area with the rooms’ massage, the Finnish sauna, the Turkish bath, the emotional shower and the thermal Jacuzzi with music therapy,slimming massages, bandages, presso-therapy, lympho-drainage, peeling, manicure, pedicure and special anti-ageing treatments. Thanks to the support and the advice of the Thermal Spa specialized équipe your beauty and well-being program is voted to a complete personalization in the way to balance beauty farm treatments and thermal spa cures specifically created on your body and mind needs. Everywhere, from the large hall to the restaurant, from the thermal Spa to the garden, our guests will find the same comfortable and relaxing environment with friendly and attentive staff to ensure you an oasis of peace and relaxation to regain your beauty and physical form. The rooms of the Hotel Terme Acqua Grazia**** are comfortable and equipped with every comfort and elegantly furnished in classical style. All equipped with private bathroom with shower, air conditioning (warm- cold to use the client’s discretion), minibar, hair dryer, safe, satellite TV with Sky channels, private balcony, telephone with internet connection. All rooms are served by lift. The Hotel and its rooms come with all the modern conveniences of a hotel ready to welcome its guests, whether for business or leisure. Rooms are just as elegantly furnished as the common areas of the Hotel, and are absolutely comfortable for either a leisure or a business stay. These welcome guests with warm, bright colors typical of the Mediterranean and this magnificent land. Rooms, all non smokers, are soundproofed, many overlooking the sea and the thermal pool, and come in various kinds, thought out to meet every kind of need: single, twin, double, triple. All come with independent air conditioning, sat TV, Pay TV, mini bar, direct phone, adsl connection and safe. All the rooms have private bathrooms and come with showers and courtesy kit. In addition, guests with disabilities have rooms especially reserved for them. All the rooms have a pretty private balcony. € 40 - € 75 p.p.p.n. No experiences yet with Hotel Terme Acqua Grazia. Be the first! Did you stay in Hotel Terme Acqua Grazia? Let us know what you thought about it and help others to make the right choice! * I confirm having stayed in Hotel Terme Acqua Grazia. 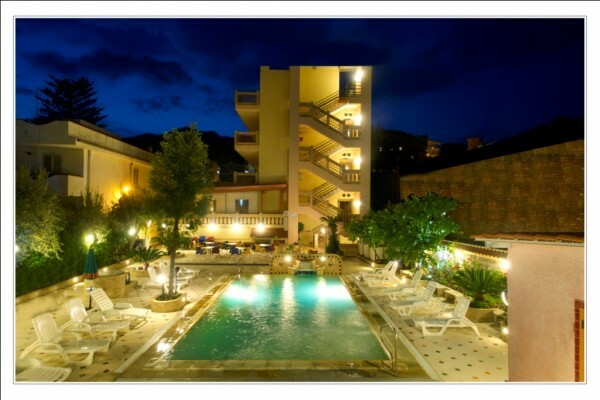 Find other charming hotels in Alì Terme or all charming hotels in Sicily.